Stockyard's pulled pork sandwich is served up on a soft hamburger bun ($8). 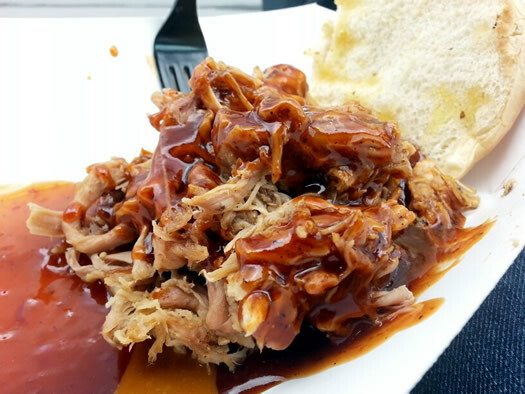 The customer is given the option for how to dress it - choose between a Carolina-style mustard sauce, a bourbon and molasses barbecue sauce with a noticeable kick of heat, or a sweet chili sauce that tastes more akin to a General Tso's glaze than something traditionally found at a barbecue joint. All three sauce options are tasty, and I took second helpings of each. 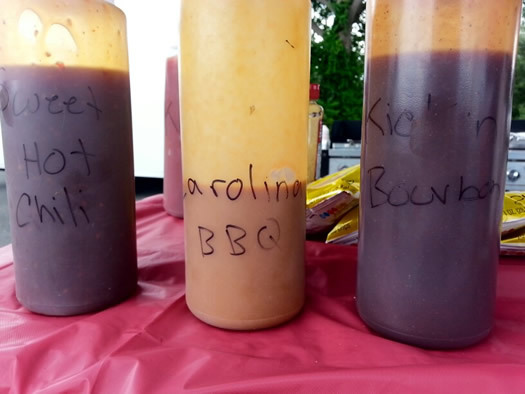 For me, though, the true winner is the mustardy Carolina-style sauce, the one most in line with how real pulled pork should be served. (Though there are many opinions on this matter, even within in South Carolina.) The Carolina mustard sauce provides a subtle heat, a vinegary pucker, and a bit of slippery lubricant to help moisten the meat and make it easier to chew. You won't find pickles or coleslaw on this sandwich -- Stockyard lets the meat stand on its own. Stockyard pairs classic barbecue items with quick-grilled items, like hamburgers. Some of the more innovative menu choices merge the two styles together: smoked, then grilled, hot dogs; Philly chicken sandwiches that highlight Stockyard's smoked chicken with grilled peppers and copious cheese. Should you show up during the morning hours, try the Breakfast Stockyard sandwich, which pairs the pulled pork with two eggs, sausage or ham, and Pepper Jack cheese for $8.50. 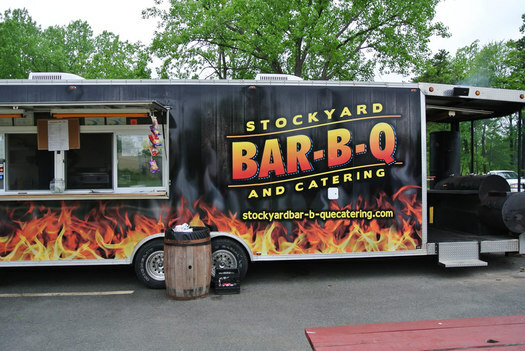 Stockyard Bar-B-Q location on Railroad Ave is convenient -- close to I-90 via Fuller, and just a short hop from the Central Ave/Wolf Road corridor. (And I'm surprised more chefs aren't on the Stockyard bandwagon - it's reasonably priced and across the street from Restaurant Depot). Even if the truck is away on a catering gig, the Stockyard team still has a small offering of items available from portable cooking gear. It might not be on the regular food truck circuit, but don't overlook Stockyard -- the barbecue is legit, and the crowds and lines are small. Get in now before everyone starts eating there. Tried 2x. Each time "pork' was mostly fat yecch. Jules - Oh, I'm so sorry you had that experience! Tried it today for first time with the Carolina sauce which you can apply so it's not over done or not enought. Need less to say it was very good and would definitely try it again. The cole slaw for me had way to much mayo and on the sweet side I was looking for more of the german style slaw. Also the sandwich comes with no sides I paid $2.95 for a small slaw so a little on the expensive side if your on a budget $11.50 for sandwich and slaw. I tried their pulled pork and sorry to say I was quite disappointed. No deep smoke flavor, no big chunks of meat, too much sauce. This truck was terrible. Service was cheerful enough, and someone came out to my table to ask us how the food was, but I may have been too in shock to tell let him know the truth. The pork ribs were smoky enough, but clearly hadn't spent much time cooking over low heat; they were tough and it took a lot of effort to gnaw the meat off the bone. There was no evidence that they had been dry-rubbed at all, except for one single rib (the ribs are served already separated) - an end - that looked like it had been dusted prior to being burnt. Was I getting my half-rack from two different batches? Friend's brisket on a sandwich wasn't sliced as it is at most good places, but was instead offered as a puzzling mess of stringy, "pulled" brisket. I suppose that's a valid way of serving brisket too, but it came slathered in sticky, saccharine sauce - an ounce of sauce covers a multitude of sins, right? Worst of all was the "macaroni and cheese". I still haven't figured out what they did to this. I received an unappetizing cup of jaundiced starch paste that I can scarcely bring myself to believe was offered by someone purporting to be a professional cook. It'd be unforgivable enough if the pasta had only been woefully overcooked to death and mixed with some inscrutable and completely unseasoned yellow sauce - but at Stockyard Bar-B-Q, they appear to finish the dish by running it through a Robot Coupe in order to turn it into a sickening pablum. There wasn't a single intact piece of macaroni in the entire serving. I couldn't even finish half a forkful. $18 for a half-rack of ribs, a canned beverage, and puree of mac. Disgraceful.